On the morning of March 7, 2018, two friends were skinning Mt. Arkansas to ski the spring snow in Moonshine Couloir. While nearing the top, the two caused an avalanche in the Couloir and luckily one was able to call for help from his smart phone. 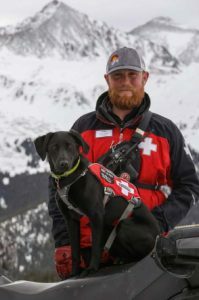 The Lake County Sheriff’s Office received the report of a skier caught and buried, and quickly requested mutual aid from Summit County for the incident, which included a C-RAD team from A Basin. Other C-RAD and Summit County Rescue Group members also responded to incident command for support. The A Basin team was dropped off by Flight For Life (FFL)’s Lifeguard 2 below the avalanche and skinned up to the patient, who was not completely buried and able to communicate with rescuers. The C-RAD team was able to extricate the victim from the debris, assess his medical condition and then begin packaging the patient on the FFL sked. The C-RAD team lowered the sked, with the patient, traveling over 700’ to the waiting FFL, where he was flown to the hospital to recover from his injuries. Once a successful handoff was made to the FFL crew, the team of three (tech, handler and dog) made their way out of the field to incident command off Highway 91. The C-RAD team arriving via FFL describe a challenging landing situation, where the pilot was fighting downdraft winds, and made six circles around in order to find a safe landing zone, LZ. Whenever they tried to land at the bottom of the avalanche, the pilot lost power due to down-wind-pressure, so the team offered “just land anywhere you can safely,” – which is why they ended up several hundred feet below the involved skier. Naturally, the injured skier was stoked to get some help, and the C-RAD team freed him from his partial burial, wrapped him in a heat blanket and additional jackets. While they built the sked, they dug out hot tea from the victim’s pack, and tried to get the victim to relax for the additional half-hour it took them to gain the helicopter. 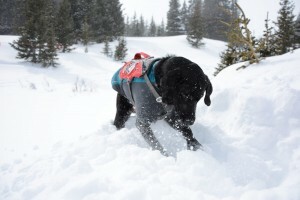 Having successfully handed off the patient to the FFL crew, the C-RAD team made their way to highway 91, where Doug Lesch staged a drill – hid for Max – so the dog would continue to be a worthy K9 asset.